Acknowledged author Kathleen Deska Pagana PhD RN wrote Mosby's Manual of Diagnostic and Laboratory Tests, 6e comprising 1162 pages back in 2017. Textbook and etextbook are published under ISBN 0323446639 and 9780323446631. Since then Mosby's Manual of Diagnostic and Laboratory Tests, 6e textbook received total rating of 4 stars and was available to sell back to BooksRun online for the top buyback price of $23.19 or rent at the marketplace. 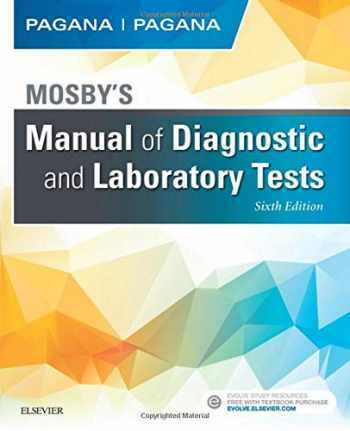 Writing care plans, understanding and performing tests, and interpreting test results is made easier with Mosby’s Manual of Diagnostic and Laboratory Tests, 6th Edition. This essential resource provides clear, concise overage of over 700 of the most commonly performed diagnostic and laboratory tests. Valuable in academic and clinical settings alike, it is beloved for its full-color design, user-friendly organization, and illustrations that help clarify keep concepts. Updated and streamlined content with new tests ensures you have the most relevant information. A new Diagnostic Testing for the Most Common Diseases section highlights the integration of medical testing as it relates to the top diseases or clinical syndromes.Tests are presented comprehensively and consistently, in a sequence that best simulates priorities in clinical practice.UNIQUE! Clinical Priorities boxes emphasize priorities and procedure considerations specific to understanding and performing tests. UNIQUE! Test Results and Clinical Significance sections describe the significance of the test findings and discuss the pathophysiology of the disease process and how it relates to the test result. UNIQUE! Home Care Responsibilities boxes focus on post-test factors for consideration. UNIQUE! Related Tests sections list additional tests related to the main test ― including tests that provide similar information, confirmatory information, and other tests used to evaluate the same organ, disease process, or symptom complex.UNIQUE! Critical Values sections indicate test values of particular significance.UNIQUE! Icons indicate drugs that increase or decrease test values and patient teaching priorities.Age-Related Concerns boxes address pediatric and geriatric priorities. NEW and UPDATED! New tests have been added and outdated tests have been removed to reflect current best practices.NEW! A Diagnostic Testing for the Most Common Diseases section highlights the integration of medical testing as it relates to the top diseases or clinical syndromes.